A simple tool used to keep geese away is turning heads in Parkville, Missouri. Park University uses a coyote decoy to keep the geese of their soccer field. PARKVILLE, Mo. — A simple tool used to keep geese away is turning heads in Parkville, Missouri. 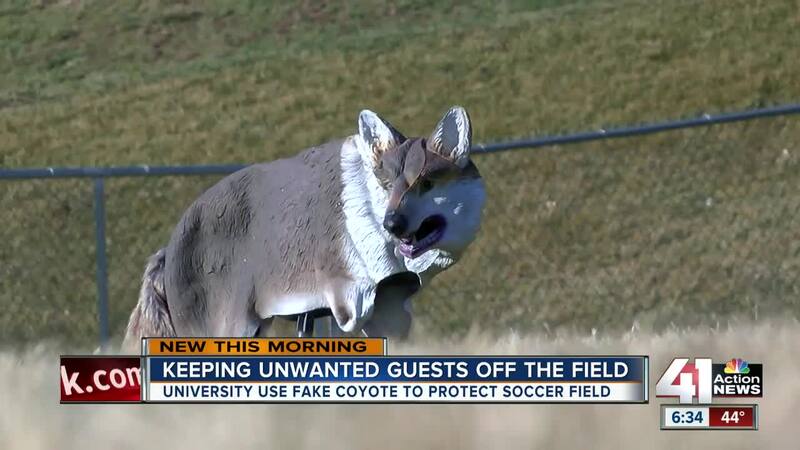 Park University uses a coyote decoy to keep the geese of their soccer field. "It's working, so we are going to keep doing it," said Jay Griggs, sports field specialist for Park University. The decoy not only works great to keep the geese away — it also fools a lot of people who drive by the field every day. "That's kind of our joke in the shop is, how many people are going to stop, how many people are going to throw things at it," Griggs said. "We'll find rocks and sticks and everything out here cause people think it's real. Sometimes even when people know what it is, they still do a double take." The decoy continues to play an important role for the university after the geese problem arose. "A few years back we came out here and there were probably a few hundred geese on the field, so we knew we had to do something," Griggs said. The geese feed on the grass, wearing it down to the roots, and leave behind feces that destroys the field even more. It can take up six weeks and thousands of dollars to repair the damage, Griggs said. So the decoy (which cost less than $100) is a great investment. "This year we haven't had to put a whole lot of work into it, we've put it out and it's stayed there since we put it out in January," Griggs said.